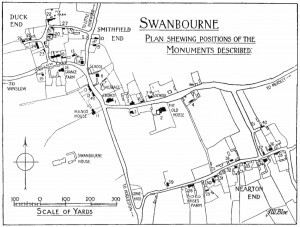 An Historic building survey was required by the government for all villages in England and Wales. 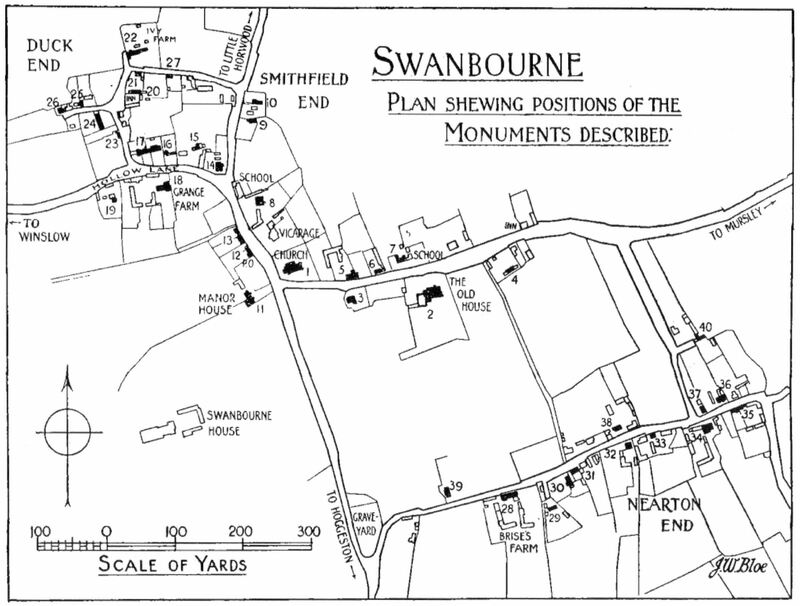 This is the survey map used to identify buildings of historic importance. Item (1) St. Swithuns Church – full of detailed descriptions of the features of architectural and historic importance both externally and internally are in the original 1913 report. These buildings are almost all of two storeys and most of them are of the 17th century. They are nearly all timber-framed, generally with brick filling, and have been restored or altered. About two-thirds of the roofs are thatched; the rest are all tiled, except one. Most of the buildings have wide fireplaces, some of them being blocked, and original ceiling-beams. (2) The Old House, 200 yards E.S.E. of the church, is of two storeys and an attic; it was built probably late in the 16th century, and has considerable modern additions. Condition—Good, much altered. (4) Cottage, now two tenements, 100 yards E. of (2). In front the filling in the wall is partly of plaster. The central chimney stack is of thin bricks. Condition—Poor; rotten and broken floor, etc. ; the E. tenement is unoccupied. (5) Deverell’s Farm, 70 yards E. of the church, is a house of two storeys and an attic; the walls are of stone, and one stone is dated 1632. Consists of a rectangular block, facing S., with a small porch-wing in front, and a larger wing at the back, extending towards the N. S. Elevation:—The porch-wing has a modern outer doorway of stone; the inner doorway is of old oak with a moulded frame and a door of battens, now painted; on the first floor is an original stone mullioned window of three lights, and in the gable is the stone inscribed with the date 1632. Condition—Good. (6) Cottage, 110 yards E. of the church. The front has been re-faced with 18th-century red and black bricks and heightened with modern brick. At the back and W. end the filling in the walls is partly of plaster. The central chimney stack is of 17th-century brick, restored above the roof. Condition—Good. (7) House, adjoining the Infant School, 150 yards E. of the church, is of two storeys and an attic. The plan is L-shaped. The S. and W. walls are entirely covered with plaster; the E. wall has a half-hipped gable. With modern additions. Condition—Good. (9) Cottage, now two tenements, at Smithfield End, 220 yards N. of the church. The S. front has been re-faced with modern brick; the central chimney stack has been re-built. Interior:—The staircase is of old oak. Condition—Fairly good. (10) Cottage, 250 yards N. of the church. In front the E. half of the wall has been re-faced with modern brick. The chimney stack at the W. end has been re-built. Condition—Good. (11) The Manor House (opposite to the church) is of two storeys and an attic, with a small cellar, built in the second half of the 16th century. Plan originally rectangular, facing E., with a central porch-win gin front; part of the building N. of the porch has been pulled down, and a modern S.W. wing has been added, making the plan L-shaped. The house is a good example of 16th-century architecture, of stone. Interior:—On the ground floor the southern most room has a 16th-century stone fireplace with moulded jambs and four-centred arch in a square head. The northernmost room has a large open fireplace, partly blocked. One original oak panelled door; the staircase is of old oak, brought from elsewhere. The stairs leading to the cellar are original. In the attic, rough timbers of roof are visible. Condition—Structurally good. (12) Cottage, now the post office and a tenement,40 yards N.N.W. of the church, was built probably late in the 16th century. In front the brick filling in the wall is set in herring-bone pattern and partly covered with plaster; on each floor are three mullioned windows; one window on first floor is blocked. Condition—Good. (13) Cottages, a range of four, N. of (12). The E. front and N. end are entirely of modern brick. At the back are some low modern additions. One rectangular chimney stack is of thin bricks. Condition—Good. (14) Charlton Hill Farm, 180 yards N.W. of the church. The plan of the 17th-century house is T-shaped, but the N.W. angle between the wings is filled by a modern addition. The S. front has been heightened and re-faced with modern brick. The central chimney stack in the longer wing is of thin bricks. Interior:—One room is lined with early 17th-century panelling, of oak, now painted. Condition—Good. (15) Cottage, now a shop, 20 yards W. of (14).The front has been re-faced with modern brick, and at the back are modern additions. The central chimney stack is of thin bricks. Interior:—On the ground floor the large open fireplaces are now used as recesses. Condition—Good. (16) Cottage, 70 yards W. of (14). The front has been re-faced with modern brick. The central chimney stack is of thin bricks. Condition—Good. (17) Cottages, now four tenements, W. of (16),are of two storeys and an attic; the W. half of the building has been re-faced with modern brick, and the roof is partly covered with slate; the central chimney stack in the E. half is of old thin bricks. At the back and E. end there are modern additions. Interior:—On the ground floor the large open fireplace in the old stack has an oven and chimney-corner seat; the oak staircase is of the 17th century. Condition—Fairly good. (18) Grange Hill Farm, 220 yards N.W. of the church. The house is of two storeys with a cellar. The plan is T-shaped; the main block, running N. and S., and the short central wing, extending towards the W., were built at the end of the 16th century; the wing was extended towards the W., probably c. 1660. The external walls have been much re-built with modern brick. The central chimney stack in the main block is square with a V-shaped or square pilaster on each face, and is built of thin bricks; the late 17th-century extension has, at the E. end, a stack with four attached square shafts, probably contemporary with the extension. Interior:— First floor – original stone fireplace and flat four-centred arch in a square head; the jambs have moulded stops; three doors of late 16th or early 17th-century panelling. Condition—Good. (19) Cottage, 60 yards W. of (18). The plan is T-shaped; the central wing, at the back, is partly original, the rest of the building is modern. The chimney stack at the N. end of the wing has three square shafts, built of thin bricks. Condition—Good. (20) The Boot Inn, 300 yards N.W. of the church. The walls have been much re-built. The projecting chimney stack at the E. end is of old thin bricks. Interior:—On the ground floor the large open fireplace in the old stack has corner seats. Condition—Good. (21) Cottage, at the corner of a lane running E., 50 yards N. of (20). The S. front has been re-faced with modern brick. At the back is a low modern addition. The central chimney stack has been re-built. Condition—Good. (22) Ivy Farm (Maunder’s Farm), 345 yards N.W. of the church. The plan of the house is L-shaped, the main block projecting towards the E., and the short wing towards the S. Main block probably built at the start of the17th century; at E. end is an extension, formerly two cottages, now outhouses, added in 1626, the date incised on a piece of wood taken from a former window-sill; a straight joint marks the junction with the original building; the short wing was added in 1718, the date painted on a brick in the W. wall under the eaves, and the stables at the E. end of the extension of 1626 are modern. Main block re-faced with modern brick in the lower storey on the S. front, and has an original central chimney stack; the extension of 1626 has a contemporary stack at the W. end, on which is incised an 18th-century sundial. Interior:—Two of the doors are of old oak battens and a third is of early 17th-century panelling. Condition—Good. (23) Cottages, two adjoining, 50 yards N. of Hollow Lane. In front the lower storey is of modern brick; at the back is a low modern addition. The central chimney stack is of thin bricks. Condition—Not very good. (24) Cottages, a range of three, N. of (23), at the S. corner of a blind alley running W. At the back are low modern additions. The central chimney stack is of 17th-century brick. Condition—Poor; in one cottage the first floor is propped up with temporary posts. (25) Cottage, on the N. side of the alley, W. of(24). The plan was originally rectangular, but a modern wing at the back makes it T-shaped. The E. front, and the upper storey at the S. end are covered with plaster; the S. wall of the lower storey is modern. The central chimney stack is of thin bricks. Condition—Good. (26) Cottage, formerly two tenements, at the end of the alley, on the N. side. The walls are of brick; the front is modern. The central chimneystack is of thin bricks. Condition—Poor. (27) Cottage, on the S. side of the lane, 100 yards W. of the Little Horwood road, about 330 yards N.W. of the church. The S. front is of modern brick. At the back, facing the lane, are low modern additions. At the E. end is a chimneystack with the lower part of squared stones, the upper part of brick. Condition—Fairly good. (28) Brise’s Farm, about ¼ mile S. of the church. The house is of two storeys and an attic built probably late in the 16th century. The walls are on stone foundations. The N. front has closely spaced timber-framing in four bays, the principal posts having struts; the brick filling is set in herringbone pattern, and has been slightly restored; there are three very small original oak-mullioned windows, each of two lights and all blocked. The E. end is covered with plaster and has a low modern addition; the W. end is of modern brick. Most of back wall is original, brick filling set in herring-bone pattern; on the ground floor is a small original window, of three lights. The central chimney stack has four shafts forming a cross-shaped plan. Interior:—On the ground floor the chimney corners of the remaining large fireplace have been enclosed in cupboards. First floor – original fireplace is of stone, with moulded jambs and flat four-centred arch in a square head. Condition—Good. (29) Cottage, at the end of an alley, 50 yards E. of (28). All the walls have been partly restored with modern brick. The central chimney stack is original. Interior:—The staircase is of old oak. Condition—Fairly good. (30) Cottage, now two tenements, 70 yards E. of (28). At the N. end is a heavy projecting chimney stack, partly of stone and partly of brick. At the S. end is a weather-boarded addition. The central chimney stack is original. Condition—Poor. (31) Cottage, and shop, 90 yards E. of (28). The dormer windows have original frames, and the central chimney stack is also original. Interior:—On the ground floor the large open fireplace retains the original oven and chimney-corner seats. Condition—Poor. (32) Brooks’ Farm, 180 yards E. of (28). The W. wall of the house has plaster filling, and is covered with ivy; the chimney stack has been restored. At the back is a modern addition. Condition—Good. (33) Cottage, 220 yards E. of (28). The projecting chimney stack at the E. end is of old bricks restored at the top; the central chimney stack has been restored. Interior:—On the ground floor an original fireplace has corner-seats of oak enclosed in cupboards. Condition—Fairly good. (34) Athawes’ Farm, 300 yards E. of (28), is a house of two storeys with a cellar. The N. front was re-faced in the 18th or 19th century with red and black bricks. The E. and W. ends are of brick covered with plaster. At the back is a modern wing, making the plan L-shaped. The central chimney stack is of thin bricks. Condition—Good. (35). Cottage, 340 yards E. of (28). The walls are of brick, and the upper storey is covered with plaster; at the E. end is a modern addition. The central chimney stack is of thin bricks. Condition—Fairly good. (36) Cottage, formerly the White Hart Inn, 320yards E. of (28). The plan is L-shaped. The S. front is covered with plaster, and the E. end with rough-cast. The whole building has been much restored. The projecting chimney stack at the E. end is of thin bricks. Condition—Good. (37) Cottage, at the E. corner of a lane running N., 300 yards E. of (28). The S. end is of modern brick. The central chimney stack is original. Interior:—On the ground floor the remaining wide fireplace has been partly blocked, but retains the original oven. The staircase is of old oak. Condition—Fairly good. (38) Cottage, opposite (32), 170 yards E. of (28). The walls are almost entirely of modern brick. Condition—Fairly good. (39) Cottage, 80 yards W. of (28). The S. half of the building is of modern brick, the N. half has plaster filling in the timber-framed walls. Condition—Good. (40) Cottage, on the E. side of a lane running N.,100 yards N. of (37). On the S. front and at theW. end the lower storey is of brick. At the back is a modern wing, making the plan L-shaped. The central chimney stack is of thin bricks. Condition—Good.